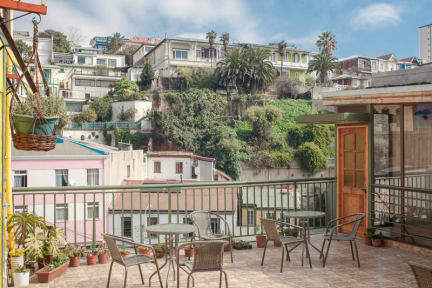 La Galería is a B&B in an old colonial house ( casona ),with a large patio and a beautiful view of the hills of the city, ideal to take a sunbath and enjoy the generous breakfast with his natural juice. The house has two floors and spacious rooms all with free WIFI and TV. The perfect place to get some rest and escape. La Galería offers a quiet place with easy access to every interesting sites. La Galería is located in the Cerro Concepcion in the middle of the UNESCO area, ideal to discover the city and all her beautiful street full of art. Really close from restaurants, bar and museum. In this sense, we are near to some of the most important attractions of the city such as Ascensor Reina Victoria, Plaza Victoria, Ascensor El Peral and Monumento a Los Heroes de Iquique, amongst other important landmarks of the city. We have several types of rooms for several sort of guests and travellers. We have dorms with diverse capacities as well as we have private accommodation options with different capacities. In addition, we also count with several common areas where the guests and travellers can get together and exchange past experiences and future plans. Check in from 14:00 to 18:00 . Check out from 11:00 to 12:00 .